Observation - Graveyard lichens - UK and Ireland. Description: ID is for the grey lichen with orange apothecia. I think the black lichen also present is Verrucaria nigrescens. 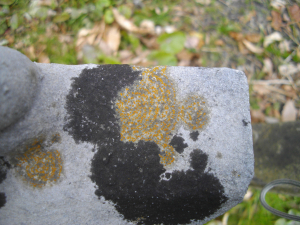 ID is for the grey lichen with orange apothecia. I think the black lichen also present is Verrucaria nigrescens.